A partial human skull was discovered in a wooded area near Saline Creek in Natchitoches Parish Saturday, Sept. 30 according to Natchitoches Parish Sheriff Victor Jones. 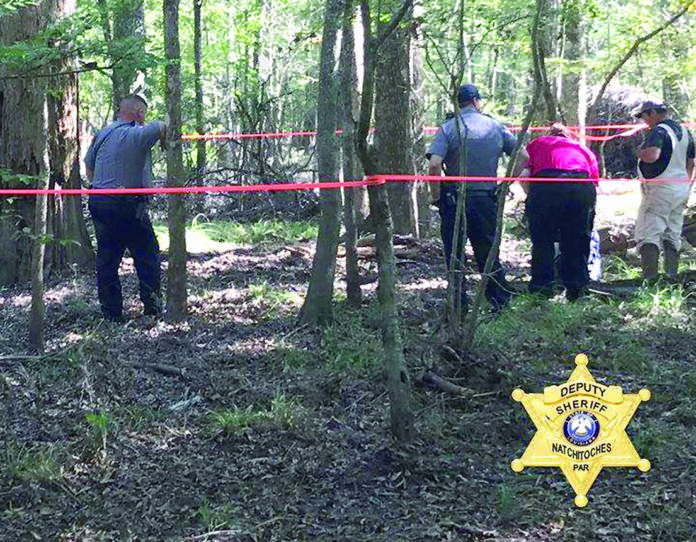 At 1:40 p.m., Natchitoches Parish Sheriff’s Deputies and members of the Natchitoches Parish Coroner’s Office responded to a reported possible human skull discovered by hunters in a wooded area off of Savoy Road near Goldonna. Deputies responded to the area with all terrain vehicle equipment. Detectives assigned to the NPSO Criminal Investigations Division were notified and responded. Hunters showed deputies the location of the discovery. According to Natchitoches Parish Asst. Coroner Steven Clanton, a partial human skull in a decomposition state of approximately three to five years was found. Chief Doug Rachal, NPSO Search and Rescue Leader, stated deputies searched the area for approximately four hours looking for evidence and clues, however, no additional evidence was found in the area. “This is an area where Saline Creek water levels have been elevated in the last year and we believe the water current may have brought the remains from another area to this point,”Rachal said. The partial skull will be transported by the Coroner’s Office to the LSU Forensic Anthropology and Computer Enhancement Services Lab for further analysis and investigation. Sheriff Jones said Winn Parish Sheriff Cranford Jordan was notified of the discovery since Saline Creek also runs through Winn Parish and this is very close in proximity. If you have any questions concerning this investigation contact Det. Darrel Winder of the NPSO Criminal Investigations Division at 357-7830.